On Friday, the hacking group Anonymous posted on YouTube a recording of a confidential conversation between the FBI and London’s Metropolitan Police. Anonymous also released a copy of an email sent to the invited participant of the conference call. The email, sent January 13, contained a single code to be used by participants to gain access to the call. Along with the FBI and Metropolitan Police, members of agencies in Ireland, France, the Netherlands, Germany, and Sweden also received the email invitation. An official from the FBI informed the press that Anonymous had not hacked any bureau system, but had probably accessed the email account of one of the call invitees. The FBI is currently carrying out a criminal investigation of the matter. Since 2010 there has been an ongoing international criminal investigation into the group Anonymous. That year the group attacked Master Card, PayPal, and other websites that stopped collecting money for the organization WikiLeaks. Investigations are also underway into Lutzec, Antisec, and other hacking groups suspected of hacking the Central Intelligence Agency, Britain’s Serious Organized Crime Agency, Japan’s Sony Corporation, and Mexican government sites. 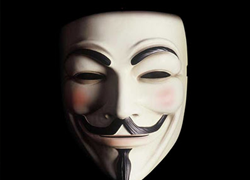 Anonymous, whose members don white Guy Fawkes masks for public demonstrations and leave the image on websites they hack, accuse the organizations they attack as having abandoned justice, freedom, and democracy. The group includes members from the US, UK, Ireland, and Germany. Many of the suspected hackers are young people and teenagers. The group has also been linked to attacks on the Justice department; the Church of Scientology; the music industry; and Neal Puckett and Haytham Faraj, the lawyers who represented Sergeant Wutench in the Haditha case. Following Friday’s posting of the FBI-Metropolitan police phone conversation, Anonymous attacked a Boston police website and took over a site belonging to Greece’s justice ministry.